To many, Free Jazz was a bold move to return to the primal voice, a wordless call of celebration and anxiety to the Infinite. Surely, one man's musical expression may be another's gutteral noise, and Coltrane certainly had his detractors at the end, attributing his forays into the improvisationally mystical as a sell-out owing more to heroin and heresy than god-hunger. John Coltrane's lyrical, poetic tenor sax had long made him the successor to Charlie Parker by the time he embraced free improvisation. Building off the experiments of Cecil Taylor and Ornette Coleman, and combining that sound with his own deep spiritual quest, Coltrane's final few records are, if difficult to some, revelations of pure emotional expression. From Ascension in 1965 until his death in 1967, Coltrane sought pure communion with God in his music, and made some of the most daring and liberating sounds ever. His explorations of Indian and African music in that quest proved that this was a serious immersion, a journey through the ways various cultures expressed spiritual ecstasy, not just a drug-addled freak out. Interstellar Space is perhaps the culmination of that expression, though who knows where he would have continued to travel had he lived. Such intensely personal music inspired countless musicians to take a similar path, notably Albert Ayler, Pharoah Sanders and, if he'd have admitted it, Miles Davis during his electric years. Can such a personal quest also be a blueprint for others for expressing the Unexpressible? 1999 saw guitarist Nels Cline and drummer Greg Bendian record Interstellar Space Revisited: The Music of John Coltrane, a song for song (more or less) tribute to the Coltrane original. Blasphemy? Hubris? Idiocy? Certainly, trying a note for note, or song for song, tribute to an entire record is perilous, let alone one meant as an individual testimony of the soul. Still, as we'll see, Cline/Bendian, while not reaching or imitating Trane's footsteps, found enough clues to conduct their own sail into the mystic. Interstellar Space was recorded on February 22, 1967, but was not released until 1974. A CD reissue came out in 2000, with a couple bonus tracks. ("Leo," from 1964's Cosmic Music, and an alternate take of "Jupiter"). This session was recorded by Coltrane alone with drummer Rashid Ali, about a week after sessions for "Stellar Regions," a record from which Coltrane borrowed some melodic cues for his solos with Ali. Essentially this was a four song duet, with both men opening up new avenues of sound by listening to each other, and by challenging themselves and their instruments to follow along with the heady rush of ideas. Indeed, despite the abrasive improvs, there is a droning trancelike feel here for the listener, as if it were possible, just maybe, to feel some of what Coltrane and Ali felt during their moments in sync. This is music that feels like a frantic response to deep sensual overload. A four song ode to the planets Mars, Venus, Jupiter and Saturn, the record begins at its most chaotic. Simple bells--a call to prayer, followed by Ali's intro to "Mars," is soon followed by a ferocious, possessed performance by Coltrane, as if the flurry of chords were steps he was tripping over in trying to climb them as fast as possible. Rugged but focused, this for me is the highlight of the set, and a legitimate addition to the catalog of sacred music. It can be the case that "Mars" is the apex of a process begun with earlier Coltrane works such as Om and Ascension- the peak of his use of free improv as a spiritual vehicle. "Venus," then, seems oddly more tradtional, though it is only so in comparison to the opener. Coltrane builds of some melodic ideas set down in "Stellar Regions." Again, the bells are a cue for Ali to quickly expand the scope of the rhythm for Coltrane to step into, seemingly already in mid-trance. In the context of the expansion of the possibilities of "Mars," "Venus" is achingly beautiful. "Jupiter" and "Saturn" are sides of the same coin, with Coltrane on the former and Ali in the latter setting the tone. Coltrane's version of free jazz was more about being present in the moment, that famous "doing, not thinking" mode that adepts of most religions talk about as a needed partner along the road to enlightenment. Given that, did Nels Cline and Gregg Bendian think or act that way in their tribute to Interstellar Space? While it is impossible to know, it raises an interesting set of questions: did they get any spiritual benefit from the process? Was that a goal? Was Coltrane even looking to offer an avenue for such benefit, or were his last recordings, however overt, a private dialogue between himself and God? Nels Cline and Greg Bendian both have a history of dipping their toes into both commerical and experimental music, and are confident and often revelatory in both. Recorded over two days in 1998, in New York on February 23, 1998 and in West Hollywood, California on April 6, 1998, Interstellar Space Revisited was surely the ultimate test for both of them, as musicians, improvisors, and maybe on other levels as well. The six tracks they recorded were done live, with no retakes or overdubs. In addtion to the four song planetary cycle of the original, Revisited has two curious additions: "Lonnie's Lament," from 1964's Crescent, which oddly is the track that most approaches the grace and soul of Interstellar Space. They also give "Leo" a try. In the liner notes the duo make clear that they approached the project, and the power of the music, in humility, and were not attempting to improve on or merely copy Coltrane. That is evident; often, the original tunes are a framework for new musical exploration. While on Interstellar Space. there is a clear sense of it being a duet, with Ali also siezing the moment to test himself and his instrument, on Revisited, the star is clearly Nels Cline. Perhaps because his instrument is the guitar and not tenor sax, Cline tends to overwhelm the jams, leaving Bendian to pound along as best he can; speed, rather than any rhythmic counterpoint to the guitar, is his contribution. Unlike Rashid Ali, Bendian does not often, except in portions of "Lonnie's Lament," reach a level of understanding with his partner, and mutually pushes back and beyond. Often, Cline and Bendian seem to be hammering away lost in the their own private reveries. That isnt a knock, since spiritual music would have to affect each individual differently; in this case, it makes for a lack of focused power. Again, their versions of "Mars" and "Lonnie's Lament" are the only two tracks where there are moments that approach the sublime, trance-inducing nature of the original. As an individual presence, Cline comes closer. Volume and effects give him more weapons with which to produce subtle colors and brute force to his work. One clearly hears moments in which he seems lost in the engine-room of the song, and pushes himself beyond his limits. The fact that his limits are not the same as Coltrane's limits is, again, no flaw. Cline is at his best when, as on "Mars," he loses the song entirely and uses it as a basis for his own motives. In these moments, it is not so much a tangent from the original, but a proof of having felt the lesson of the song's intent. Ultimately, the remaining limitations of Interstellar Space Revisited are the comparison to the orignal tracks and the second-hand spirtual exercise, though the latter remains open to debate. 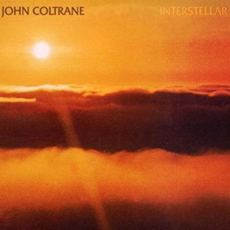 John Coltrane's Interstellar Space is a fearless and beautiful record. Together with Ali, Coltrane continued his sonic explorations of the mystical feelings growing within him in his last years; both men played free and open to any and all signs and sounds they were able to invoke. While Interstellar Space Revisited does not reach those heights, Cline and Bendian allow themselves the opportunity to explore new avenues, certainly physically, and on occasion, spiritually as well. It is a barbaric yawp not so much in tribute as in gratitude for the lessons of Interstellar Space.